Deteriorating soil causes problems with our food supply and, surprisingly, leads to more carbon in the atmosphere. See what farmers and nonprofit organizations are doing to improve our farmland and our environment. It’s barely May, but Aspen Moon Farm is bustling with fall harvest-like activity. The inclusion of seedlings in its offerings makes today’s farmers market preparations hum. At least half a dozen helpers line the long dirt drive up to the house, where owner Jason Griffith breaks for a sandwich in his enclosed patio. At 45, Griffith has been farming this plot of land in Hygiene, Colorado, for just a few years—but long enough to expand to 10 acres and learn some critical lessons. "When I first started farming I was gearing all of my production toward 'how many crops can I get out of this bed or that bed and how intensely can I plant?'" he says. That approach—despite organic and biodynamic cultivation—resulted in soil degradation, evidenced by diminished plant health and increased pests. Griffith reassessed his multiple annual harvests. "We realized we were going to wear that field out quickly. It was interesting to see how fast it could happen." Wearing out the field is not unique—modern agriculture relies on synthetic chemicals for fertility, too often viewing soil simply as an inert growing medium. What’s unique about Griffith—as with other small-scale organic farmers dependent on nutrient- rich soil—is he chose to do something about it. For Griffith, the solution unfolded by reframing the farming effort. "It’s really just about changing the focus from the crop to the soil and what does the soil need so we don’t have to add a ton of fertility every year." Reducing added fertilizers—natural or otherwise—meant giving scheduling priority to soil-building crops above revenue-producing ones. "Instead of setting up my schedule and saying, ‘I need to plant carrots, beets and all this stuff where I want, whenever I want,’" Griffith says, "I’m basically saying: ‘I need to have a cover crop in this field by this date.’” Then he determines what vegetables work in rotation. The result is a productive farm with a year-round focus on maintaining or improving soil fertility. Related: Meat, the unlikely climate hero? 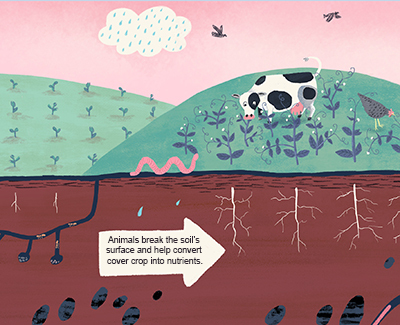 This emerging awareness often comes in three words: Soil is alive. And with that comes the breadth of reasons to take care of it. Hint: It’s not just about food. It would be difficult to find a more passionate soil advocate than Tom Newmark. The former CEO of New Chapter supplement company, Newmark is cofounder and board chair of The Carbon Underground and co-owner of Finca Luna Nueva lodge and biodynamic farm in Costa Rica. Possibly the biggest and most overlooked ecological service soil provides, however, is its role in climate change—via carbon sequestration. Global soils are, in fact, massive carbon storehouses—yes, that carbon: the temperature-raising, sea level-raising stuff of inconvenient headlines. The opportunity to lock this excess atmospheric carbon into the ground is at the root of a movement called regenerative agriculture. But with this comes awareness of the inverse impact: the vast release of carbon by agricultural means. “In fact,” Newmark says, “somewhere around 40 percent of the excess carbon dioxide in the atmosphere comes directly from the soil.” That’s astounding in a world where human solutions to human-caused climate change tend toward the cars we drive and the lights we turn off. Newmark’s 40 percent is difficult to substantiate. A U.N. paper puts it closer to 30 percent. But, says Newmark, that doesn’t account for the soil organic matter oxidized due to tilling or nitrogen fertilization. Regardless, in the broad view of climate change there’s a double win that comes from carbon-rich soil. 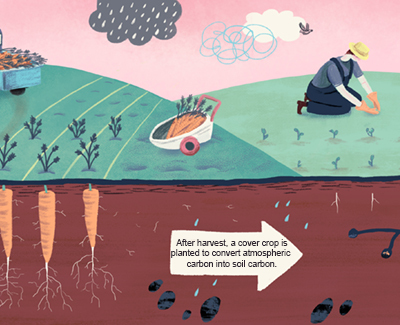 In addition to slowing or even reversing atmospheric carbon, soils richer in carbon (read: sticky, quenched) are also more resilient to the impacts of climate change. This is good news, and it sounds even better the astonishingly simple way Newmark puts it: The soil lost its carbon, it wants it back and it knows how to get it. “There’s actually technology that is time-tested, safe and available worldwide for free that will take all the carbon we have irresponsibly let loose in the environment and bring it back to earth. That technology is called photosynthesis.” There’s a third win, too: Getting that carbon into the soil is synonymous with the soil fertility Griffith is looking for. We have long known the dangers of nitrogen fertilizer. Its rampant use has been linked to coastal dead zones, fish kills, groundwater pollution, air pollution and even “reduced crop, forest and grassland productivity,” according to the United Nations Environment Program (UNEP). What is newer to the dump on nitrogen is its direct correlation to carbon release and climate change. But, hold on: Nitrogen is a necessary plant nutrient, and the now 100-year-old ability to synthesize nitrogen from thin air is a key part of the agricultural “Green Revolution” that brought more food, more quickly, to more mouths in the mid-twentieth century. The need for nitrogen is what makes synthetic fertilizer so effective, and effectiveness is what makes its use so widespread. down to complex underground trade negotiations, Newmark explains. In order to uptake nitrogen naturally, plants undergo an elaborate exchange with soil bacteria. Although both carbon and nitrogen are amply available in the air, they are inaccessible depending on who’s asking for it. Plants can’t get at the nitrogen; bacteria can’t get the carbon. “But,” says Newmark, “the bacteria have the nitrogen and the plants have this carbohydrate [carbon in the form of plant sugars] so at the tip of the root of every plant there’s an exchange that can happen, where the plants can swap their carbon-rich sugars for the biologically available nitrogen that the bacteria have. Brilliant!” And natural. Further, Pizzey says he’s able to employ a no-till approach because of synthetics. “That’s the one thing organic farming has not moved on from. Tillage is the only tool they have in their toolbox to kill weeds.” Because of genetically modified crop strains and their accompanying herbicides Pizzey can run his farm with minimal tilling. Even the Rodale Institute, a world leader in practical organic farming research, agrees that no-till, by “relying on herbicides for weed control … cannot be directly adopted for use in organic production systems.” Rodale is researching and teaching methods to make no-till and reduced-till organic farming possible. There are two keys to that for Aspen Moon Farm. The first is cover crops. With cover crops, nutrients collected through photosynthesis are captured and kept within the farm system. 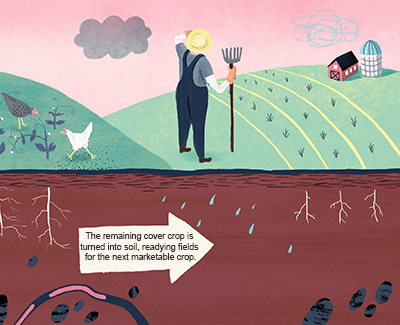 A cocktail of cover crops stocks the soil with different nutrients—including nitrogen. “A good cover crop should be able to feed next year’s crop,” Griffith says. But recent research suggests that large grazing ruminants—like cows—can be climate heroes as well. Leading the drive on this is the Savory Institute, a nonprofit organization promoting “holistic management” as a top effort to revitalize soil health and lock atmospheric carbon into the earth. Holistic management is a carefully timed system of growth, rapid grazing and regrowth, says Savory’s Chris Kerston. Regrazing, too, but not too soon. Here’s why: As the grazed grasses start regrowing above ground, their roots retract, sloughing off dead root material—which is critical. “When that piece of root dies off down there … you actually just injected organic matter into the soil,” says Kerston. Essentially, the plant—through photosynthesis and root sloughing—is pumping solar energy into the soil. In this way, “you can build depth into the soil much deeper at a much faster rate.” After the grasses regrow, the pasture may look fully recovered, but more time is required to allow the roots to regrow. Only then is it time to graze again. “What ranchers often don’t realize,” Kerston warns, “is if you don’t wait long enough for the root to also regrow, then we have an unsustainable situation—we’re going into the negative in our bank account.” The soil is missing its carbon deposits, and the plant, with insufficient root regrowth and excessive withdrawals, is suffering. Eventually the grasses stop regrowing up top, too, taking the grass out of grassland. Hence, desertification. Bunched and moving is exactly what herds of large ruminants have been for millennia. The grazing was rapid, thorough and unselective because the animals were bunched and competing for limited grasses. They were bunched—and moving—because of the omnipresence of stealthy predators. “So in our sedentary ranching systems, when we started putting up barbed wire fences it was one of the worst things to happen to agriculture,” says Kerston. Returning key biological processes to their natural state seems to be at the core of transferring excess carbon from the atmosphere—where it’s a liability—to the soil, where it’s of vast benefit. That’s good news because it means soil loss and climate change have a common solution, and all we have to do to harness it is step aside. “We have 470 million years of experience of the ecosystem producing food: converting solar energy into calories available for biology to consume,” says Newmark. This article was originally printed in Delicious Living magazine, a sister publication of newhope.com.